Squid is a really fun creature to prepare. In this recipe, we will take you all the way from having a whole squid to a delicious flash-fried meal. 1. Start by cleaning the squid. Grab the body and rip it out. Cut off the tentacles. Pull out the remaining guts from the body. Carefully peel the flaps back, which should allow you to remove the skin at the same time. If you hate fun, you could get your fishmonger to do all of this for you: just ask for it to be cleaned when you buy it. 2. Carefully cut open the body so that you can lay it flat. Cut this into smaller pieces; three works well. 3. Score each piece by cutting into it in a criss-cross pattern. Make sure you do not go all of the way through. This helps prevent it curling up when we fry it. 4. Add the olive oil, paprika, salt and pepper to a bowl. Mix to combine. 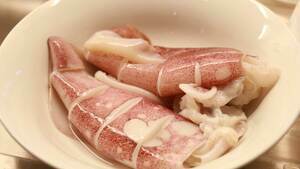 Take the pieces of squid, including the tentacles, and mix them in so that everything gets a good coating. 5. Heat a frying pan over a high heat. Wait for it to get hot. 6. Lay the pieces of squid in the pan. The side that you have scored should be facing up initially. 7. Cook for one to two minutes on each side. Then remove from the pan and serve simply with some bread.